Organizers want the fast-food giant to agree to worker-friendly supply-chain practices. For over a decade the small coalition of farmworkers and community activists have taken on the giants of Big Ag and built a new system of labor protection. Now they’re taking the fight to a Goliath in red pigtails. The Coalition of Immokalee Workers (CIW)—an internationally renowned farmworker group (and leading early labor ally of one former presidential candidate)—is leading a nationwide boycott of Wendy’s, to pressure the fast-food giant to participate in a “worker-led social responsibility” system that links corporate accountability with labor justice from farm to table. Although other brands like Whole Foods and Subway have been pressured to sign on to CIW’s Fair Food program, Wendy’s has issued its own corporate social-responsibility code, presented in a glossy 20-page booklet that workers say is full of empty promises. Wendy’s states that “Suppliers are expected to fairly compensate and provide wages, benefits and overtime premiums to their employees that comply with applicable laws and regulations.” Notably, the plan does not layout general rules for fair labor conditions beyond the legal minimum, without mandating direct sanctions for suppliers who fail to meet the company’s “expectations.” CIW rejects the softer language, insisting on its own system of regular auditing under a worker-led monitoring program, which ties corporate membership in the program to a system of sanctions for violations. Wendy’s has also sought to circumvent the Fair Food program through the market, by sourcing tomatoes in Mexico, even further distanced from public scrutiny by US regulators or community groups. Various media outlets have confirmed that Wendy’s and other US mega-corporations have sourced tomatoes through Kaliroy, an arm of the Mexican agro-giant Bioparques de Occidente. A recent Los Angeles Times investigation showed Bioparques labor camps to be rife with extreme poverty, violent abuse, substandard housing, child labor and wage theft—issues that brutally echo the same kind of slavery-like labor practices on Florida farms against which CIW’s immigrant workers originally mobilized in its early campaigns. In recent years, US imports from Mexican farms—despite clear evidence of labor exploitation—have roughly tripled. In the next few months, CIW’s grassroots consumer campaign, Alliance for Fair Food, is rolling out six regional tours covering more than 20 cities nationwide, with outreach events like film screenings and workshops. 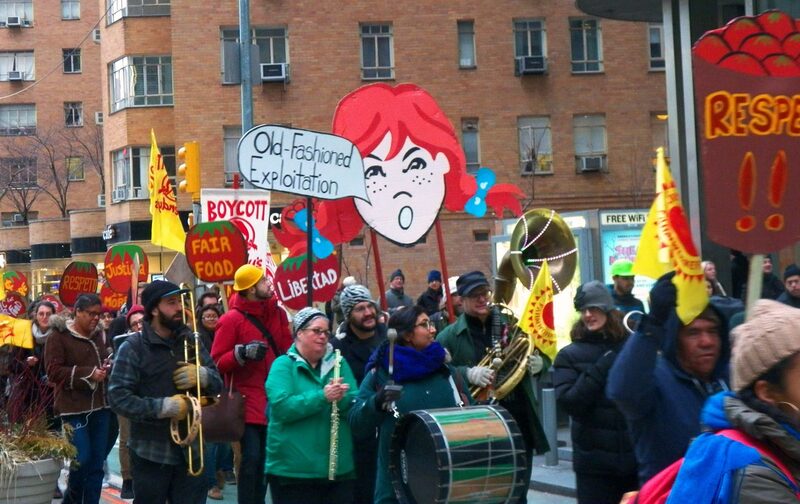 The branding of the campaign as a “Fair Food” initiative (with an accompanying labeling scheme to certify approved products), incorporates economic-justice principles for workers and the communities that are targeted by Wendy’s marketing, which sells fast food as an affordable choice in a commercial system that leaves families few options for more ethical or sustainable meals. CIW has waged similar campaigns against Yum Brands (parent company of Taco Bell), Publix Supermarkets, and McDonald’s, catalyzing public support with colorful protests, raucous music, and signs mocking corporate food behemoths, including a tyrannical Exploitation King, “Traitor Joe” tomatoes, and Wendy’s sinister grin. Labor activists have enlisted college students to stage boycotts on campuses and pressure school administrators to stop contracting with unethical tomato suppliers through dining-service firms or through on-campus chain restaurants, including Wendy’s. The fair-food model’s blend of quasi-union principles and community advocacy has in recent years expanded to farms in Georgia, North and South Carolina, Virginia, Maryland, and New Jersey. They have also launched organizing campaigns for bell pepper and strawberry crop workers, and have partnered with Vermont dairy workers to adopt the Fair Food model for their own labor-protection program. De la Cruz cited another allied labor rights campaign, the Fight for 15 fast-food workers’ movement, as a parallel organizing effort. As a counter-marketing campaign, the Alliance for Fair Food, which grew out of partnerships with faith, labor, and immigrant rights groups in the late 1990s and 2000s, shows that grassroots activism too can achieve industrial economies of scale, by linking labor rights and consumer fairness. The Coalition of Immokalee Workers’ campaign won’t overturn agribusiness. But, it’s making Florida a different kind of Swing State this November, with migrants leading the call for a new political voice: voting with your wallet for a fairer food system.